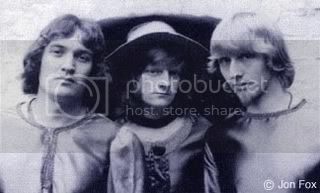 This group was likely one of the first “progressive rock” outfits to come out of the Birmingham area. They were formed in 1968 by bass guitarist/vocalist Jon Fox and guitarist Rod Godwin along with drummer Dave Thompson. Jon Fox was already a veteran of the West Midlands music scene having previously fronted his own band called The Hunters as well as having being a member of Johnny Neal’s band The Starliners with whom he played bass guitar on their debut single in 1965. Jon had also been a member of the well known local group Varsity Rag and had played guitar in The Way Of Life. Rod Godwin was from Coventry and had formerly been with Jimmy Powell and The Five Dimensions. Dave Thompson was from a Birmingham group called The Defenders. Although Cathedral composed much of their own material, they also performed re-arranged versions of popular songs. They played locally at Birmingham Town Hall and Bingley Hall Exhibition Centre as well as getting bookings at many universities up and down the country. One of Cathedral’s more well-known appearances was at the famous Scotch of St. James Club in London. The band also did some touring abroad during the late 1960s and performed at The Atelier Club in Gstaad, Switzerland as well as doing some appearances on European television. In addition to working the touring circuit under their own name, another regular gig for Cathedral during the late 1960s was as backing band for former Rockin’ Berries singer Geoff Turton. Geoff went solo in 1968 and had a hit record titled Colour Of My Love while appearing under the name of Jefferson. Cathedral was signed initially to the Polydor Records label for a while and later went to Don Arden’s company, recording a few singles such as It’s Hard Way and Tennesee Woman. The band line-up stayed the same until 1972 when Jon Fox left and re-located to Switzerland. Rod Godwin and Dave Thompson carried on for a while as Cathedral, eventually moving to Cumbria, playing venues in that area and doing session work. Jon Fox and Rod Godwin later joined the Coventry group “Jigsaw” who had a huge hit in 1975 with the record Sky High. Rod Godwin was also in the final line-up of the world-famous band Badfinger. All three members of Cathedral have stayed in the music business. and to Jon Fox and Rod Godwin for assistance in writing this bio.